I've only visited South Dakota once. 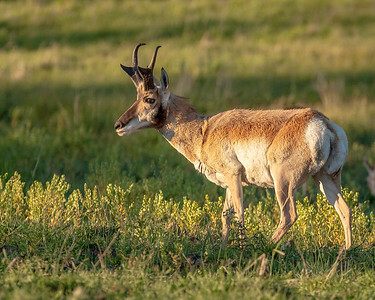 Custer State Park, in the southwest, is home to a large number of pronghorn, bighorn sheep, approximately 1,500 free-roaming bison, and countless other species of native animals. 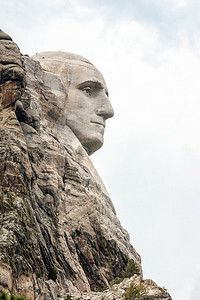 Mount Rushmore is nearby, as is Badlands National Park, an otherworldly "prairie" filled with colorful eroded buttes. Badlands National Park, in southwest South Dakota, is otherworldly. Occupying close to 400 square miles, it is filled with fascinating, sharply eroded buttes, pinnacles, and spires, and also boasts the largest undisturbed mixed grass prairie in the United States. It is home to many animals, including the black-footed ferret, the most endangered land mammal in North America. I took this photo while here in the summer of 2012. Available in the following sizes (Panorama D): 40x10, 48x12, 64x16, 64x16 Triptych (3 x 21x16), 80x20, 80x20 Triptych (3 x 27x20), 96x24, 96x24 Triptych (3 x 32x24), 120x30 Triptych (3 x 40x30), 144x36 Triptych (3 x 48x36). Taken only minutes after the panorama before this photo in the gallery, the first rays of sun from a spectacular sunrise illuminate the otherworldly buttes of Badlands National Park with a warm, orange glow. Available in the following sizes (Rectangle B): 12x8, 18x12, 24x16, 30x20, 36x24. Badlands National Park, in southwest South Dakota, is otherworldly. Occupying close to 400 square miles, it is filled with fascinating, sharply eroded buttes, pinnacles, and spires, and also boasts the largest undisturbed mixed grass prairie in the United States. It is home to many animals, including the black-footed ferret, the most endangered land mammal in North America. I took this photo minutes after sunrise, with the day's first rays of light coming in over my shoulder and illuminating the higher buttes in a warm, vibrant light. Available in the following sizes (Panorama B): 30x12, 40x16, 50x20, 50x20 Triptych (3 x 17x20), 60x24, 60x24 Triptych (3 x 20x24), 75x30, 75x30 Triptych (3 x 25x30), 90x36, 90x36 Triptych (3 x 30x36), 105x42 Triptych (3 x 35x42). A different view of Mt. Rushmore. Available in the following sizes (Rectangle B): 8x12, 12x18, 16x24, 20x30, 24x36. 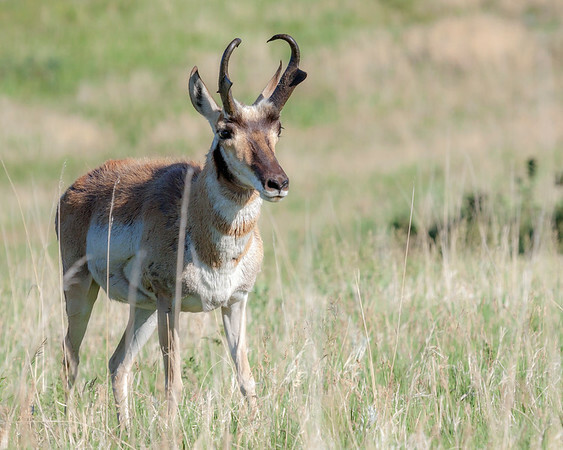 Pronghorn, often cited as the world's second fastest land animal, are in no short supply in South Dakota. Here is a lone pronghorn grazing in the fields of Custer State Park at sunset. Available in the following sizes (Rectangle A): 10x8, 14x11, 20x16, 24x20, 30x24. Approximately twenty to thirty million bison used to roam the North American countryside, but today, although they are not in any danger of immediate extinction, they number only half a million. About 1,300 of these animals live in South Dakota's Custer State Park, which I visited in the summer of 2012, en route to Badlands National Park, just to the east. 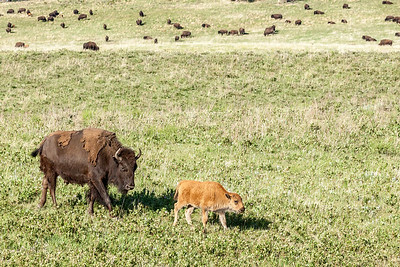 Here we see a mother and baby bison wandering the prairie. Available in the following sizes (Rectangle B): 12x8, 18x12, 24x16, 30x20, 36x24. Approximately twenty to thirty million bison used to roam the North American countryside, but today, although they are not in any danger of immediate extinction, they number only half a million. About 1,300 of these animals live in South Dakota's Custer State Park, which I visited in the summer of 2012, en route to Badlands National Park, just to the east. Available in the following sizes (Rectangle B): 12x8, 18x12, 24x16, 30x20, 36x24, 45x30. Pronghorn, often cited as the world's second fastest land animal, are in no short supply in South Dakota. Here is a lone pronghorn grazing in the fields of Custer State Park. Available in the following sizes (Rectangle A): 10x8, 14x11, 20x16, 24x20.